Folks come to Monterey for the aquarium and the tourist attractions along Cannery Row. But like all touristy areas, there’s a hidden historical neighborhood directly underneath. This is the old factory district, where Steinbeck would hang out with his pal, Doc Ricketts. You’ll learn all about the history (while enjoying the attractions) as you wander along this wonderful scavenger hunt area. Event Description: A flat, safe and diverse teambuilding venue, Cannery Row is a place visitors from around the world flock to…for the great local seafood, the shops and entertainment, and the world-class Monterey Bay Aquarium. Location History: Half a century ago it was the “Sardine Capital of the World”. Today, most people know Monterey’s Cannery Row for its most famous inhabitant, Nobel-prize winning novelist John Steinbeck. The ghosts of Steinbeck’s “Cannery Row” still walk the streets: Doc Ricketts, Dora Flood, Lee Chong. 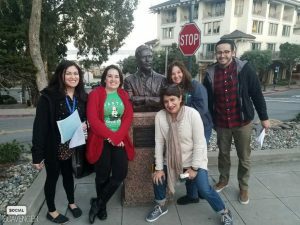 During your teambuilding treasure hunt… expect to explore the fascinating Steinbeck-related historical signage; discover a precarious telescope along the Boardwalk; a much-obscured plaque dedicated to procrastination; and a shop/museum celebrating the California otter. It’s blue skies, salty sea breezes, and a whiff of literary history on the Bay of Monterey.